In this offering, John Stossel of ABC's 20/20 gives us a tour-de-force of classical liberal thinking as it applies to many contemporary social issues. He begins by describing how he went from a crusading Naderite consumer reporter to small-government advocate by simply applying the same questions concerning vested interests, cost-benefit analyses, and of course, the law of unintended consequences to the public sector as he did the private. However, once he focused his attention to the state rather than big business, the reaction from his economically and scientifically illiterate colleages in the mainstream media establishment was, unsurprisingly, not a positive one. From there, Stossel examines many popular misconceptions about what is seen as conventional wisdom by many observers of public policy who consider themselves informed. He tackles everything from the federalization of aviation security workers to the supposed benefits of organic food to the harmful effects of rent control to the stain of trial lawyers on American society. It's clear that Stossel thinks that we worry too much, and by trying to protect everyone from every possible risk out there, we're worse off overall as a result ... that is, except for the regulators, public health officials and insulated industries who feed off the status quo and are doing pretty well for themselves because of it. Throw in a couple of concluding chapters about the issue of personal choice when it comes to risks like drug use and prostitution, and you have a practical blueprint for the classical liberal point of view in the 21st century. Overall, I really enjoyed this book because it's chock full of evidence, both empirical and anecdotal, about just how wrong-headed so much of our thinking around risk, regulation and choice is when it comes to public policy. Naturally, any conversation about this is going to lead into discussions about the size and burden of government as it relates to taxation and spending, and as a classical liberal myself, I always enjoy reading a clear-headed analysis of just how much the state costs us and how we don't get value from it for a whole number of reasons. A few criticisms, though - first, Stossel has a pretty big ego, that much is clear. Secondly, when he uses graphs and charts to illustrate his point, they're not properly sourced. I would love to know where he got the figure that the Earth's atmosphere has warmed approximately one degree Fahrenheit over the past hundred years, but he doesn't cite anything. Finally, I quibble with the title because it's misleading. Take out the word "liberal", replace it with "conservative", and it reads like a rhetorical flourish that we'd expect from the likes of intellectual heavyweights such as Michael Moore or Al Franken (yes, I'm being sarcastic). 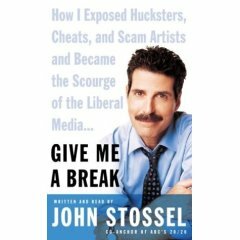 In my opinion, Stossel's work is much more credible than theirs because he doesn't engage in rabid partisanship for partisanship's sake, and so I think he does himself a disservice with the over-the-top name of this book. Republicans and Democrats alike are fair game here, as they should be. I recommend this to all fans of limited but vigorous government for a refresher on how classical liberal principles apply to North American society today, and I also suggest that if lefties want to get to know their enemy a bit better, they ought to give this one a read. Libertarianism, as it is otherwise known, is an increasingly formidable political force, and John Stossel's work is part of the reason why. How the F--- do you watch reality TV, see two-three movies, go to a live show, and read a book every single week. I know you have a civil service job but, man, you can't possibly have that much time on your hands. You're married too, remember? I don't want to start a scandal on par with the Liberal sponsorship disaster but I think you're faking your book reports. Yup, I said it. I'm on holidays this week. Lol... them's fighting words "saddy"! Hammer - you do read an F of a lot... I don't know how you do it either, but I would bet my left nut that the words are 100% Hammer.